"This Latino dish makes a refreshing summer snack with a surprising combination of flavors! Children love it." Mix cumin, coriander, chili powder, salt, and cayenne pepper together in a bowl. 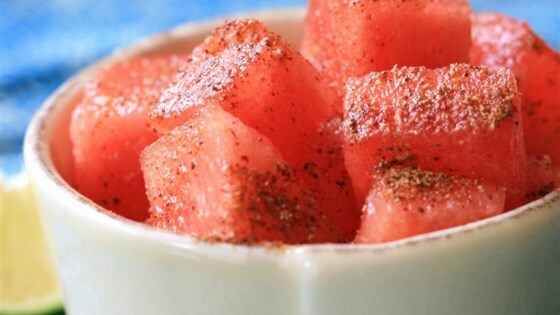 Place watermelon into serving bowls; sprinkle with spice mixture. Squeeze lime juice over spiced watermelon. This is spicy, cool and refreshing! Thanks for the recipe! What a great combination of flavours! Never would have thought to add these spices to watermelon. So glad we did. This is a must try, it's so different. Four cups of watermelon not two! This recipe makes enough seasoning for a whole personal watermelon.